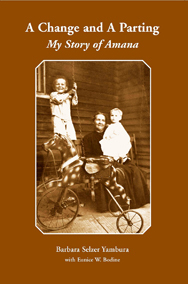 This book tells of the Amana Colonies in Iowa changing from a religious communal life to free enterprise through the eyes of a young girl. “In 1960, when Barbara Selzer Yambura first published her childhood memories of Amana, there were many Amana residents who could compare her account to their own. Today, the 1920s and 1930s are fading from our community memory. Still, the stories and characters in this book continue to make that era come alive.” – Lanny Haldy, executive director, Amana Heritage Society.